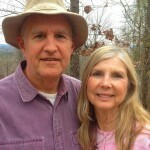 We love longleaf pines. We love the soothing sound of a gentle breeze rustling through a longleaf stand; we love that they do most of their early growing below ground where it counts; and we love that they live many times longer than other pine trees in the south. And we love that in the uncertain climate we humans face, longleaf pines are our forest’s best hope of survival. Unlike a stand of loblolly pines, which thrive by blocking all light from reaching the forest floor and choking out all understory growth, a forest dominated by longleaf pines always has plenty of diverse herbaceous growth below, which encourages diversity of wildlife. The saying about longleaf pines is that they sleep, creep, and leap, meaning that their above-ground “grass stage” skeleton remains tiny and unimpressive for the first few years while they sink a juggernaut tap root. Then they slowly emerge and begin to grow upward. Then they take off, adding several feet of vertical growth each year. Our January ritual is the planting of a box of 330 longleaf pines, so that’s what we’re doing now. This year we’re focusing on high visibility locations like the driveway between the street and the lodge, the area around the lodge and path to the pond, and the area just west of Veg Hill. 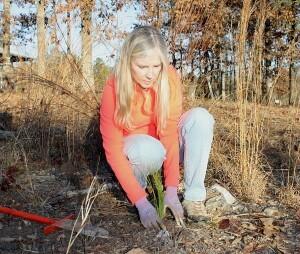 Each afternoon for the last several days, Amanda and I have planted 60-70 longleaf pine seedlings. Fair disclosure: this photo is misleading. Normally I would be manning that iron dibble, Amanda would be slipping in a seedling, and I would be closing up the soil around the seedling while she moved on to the next spot. When we’re working efficiently, we plant a longleaf pine seedling every 40-50 seconds. But somebody’s got to take the picture, right? Next Next post: Podcast #272 – Here Comes Spring!